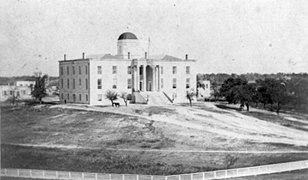 Old Capitol building, Austin, Texas, from the 1860s, exact date unknown. Photoprint from cartes des visites attributed to H.B. Hillyer. Library of Congress. Seminole subagent Marcellus Duval continued to scheme for the capture of the Black Seminole refugees in Mexico. When his agent Warren Adams proved ineffective, Duval decided to pursue the maroons himself. In late 1852, he arranged for administrative leave from his post in Indian Territory and headed for the Texas border. The agent had built up considerable enmity with the commanders at Fort Gibson, who were convinced Duval had been engaged in slave raids against the maroons. In late 1852, the U.S. Secretary of War came to the same conclusion. The secretary recommended that Duval be relieved of his post. Word reached Duval in April 1853 in Austin, before he could reach the border. After a flurry of protest letters fired off to newspapers and politicians, the former Indian agent dropped from the pages of history and from the lives of the Black Seminoles. The maroons had survived another pro-slavery foe.